Music at GMC: 2018 Sound the Trumpets again! 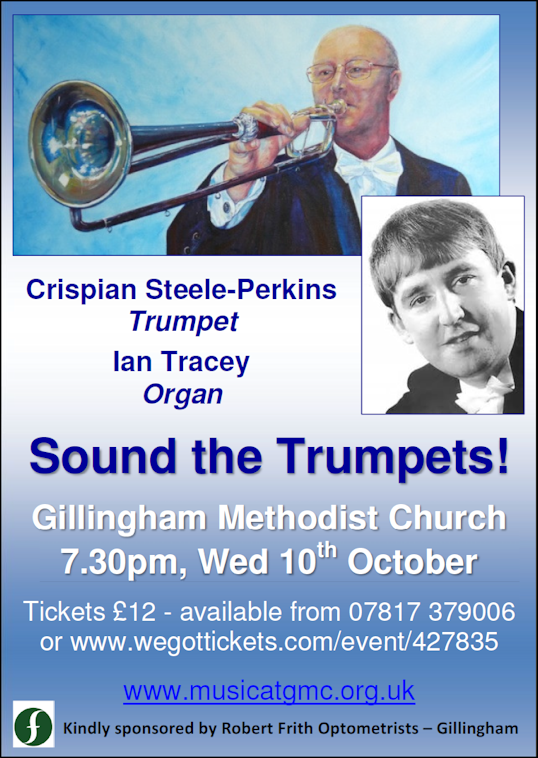 Concert: Sound the Trumpets again! Ian Tracey was due to return to GMC for his 14th visit, having entertained us before with his inimitable brand of consummate musicianship & amusing anecdotes. However, Ian was very poorly with the flu so Ian le Grice kindly stood in at the last minute. As in 2017, Crispian Steele-Perkins was the trumpeter. Together with GMC's famous trumpet stop they produced an amazing sound! IAN leGRICE is one of London's most distinguished Organists. He gives recitals, plays "continuo" and performs with Symphony Orchestras and Choirs. As a boy he became head chorister and principal treble soloist at the Temple Church, London. Subsequently he has served there as Organist, successively in association with the legendary Sir George Thalben-Ball, Dr John Birch, Stephen Layton and James Vivian. His duties have included many broadcasts and recordings, amongst them the 7 hour marathon by Sir John Tavener "The Veil of the Temple". Ian has held teaching posts at the Royal College of Music, London, Trinity College of Music and Reading University. He is also Organist of St Mary's Choir school, Reigate, musical associate of The English Arts Chorale and accompanist to the St. Cecelia Chorus and the Croydon Philharmonic Choir, of which he is Vice President. Since 2005 he has collaborated in a highly successful Duo with trumpeter Crispian Steele-Perkins. In their highly varied programmes they share their enthusiasm for presenting the best quality of music in an informal setting. German Dance Suite - Anon.